Mobile Freelance lets you check for jobs on your mobile device, include iOS and Android. Still checking for freelancer jobs only when sitting in front of a computer? Tired of sorting through categories of no interest? Mobile Freelance send you push notification when your interest job available. Mobile Freelance lets you check for jobs in bed, on the run, or anywhere else. 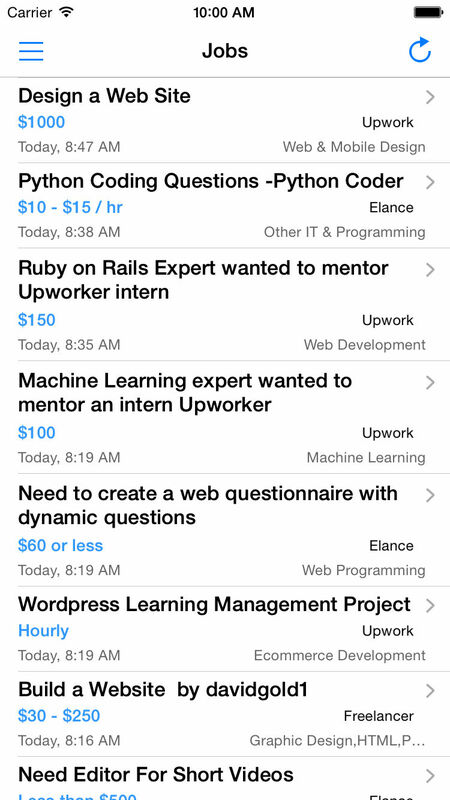 Mobile Freelance lets you choose what job categories you want to see. Check for jobs from Freelancer.com, Upwork.com. More sites to be added. Customize your own favorite categories, like PHP, Logo Design, Writing, etc. You can choose to see only those jobs in categories you select. Search jobs by price, keywords, etc. Open a job detail web page directly on your browser. Save time thanks to clean UI format that highlights jobs, budgets, categories, website info.